I love traditions and one of the first traditions we started here in our new home was a Annual Memorial Day BBQ! It’s a relaxed old school backyard BBQ with family and friends. We play music ( old and new) dance, swim and of course EAT! 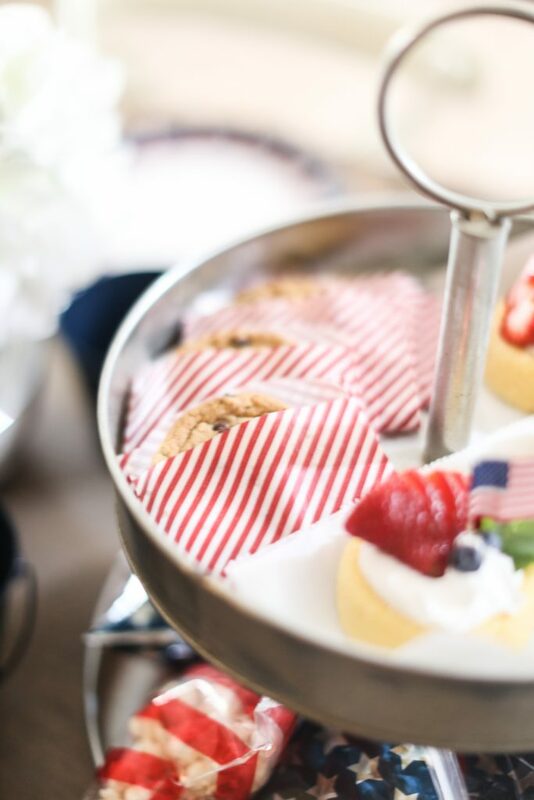 Memorial Day weekend is a perfect time to take a step back to honor all those who have served in the military and embrace small moments with family and friends! 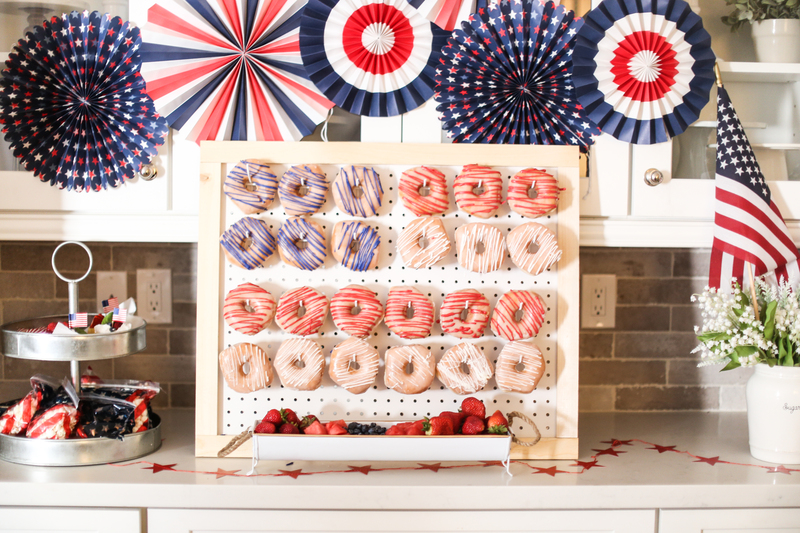 A patriotic party is my FAVORITE party to throw. Just looks at this, this and this! 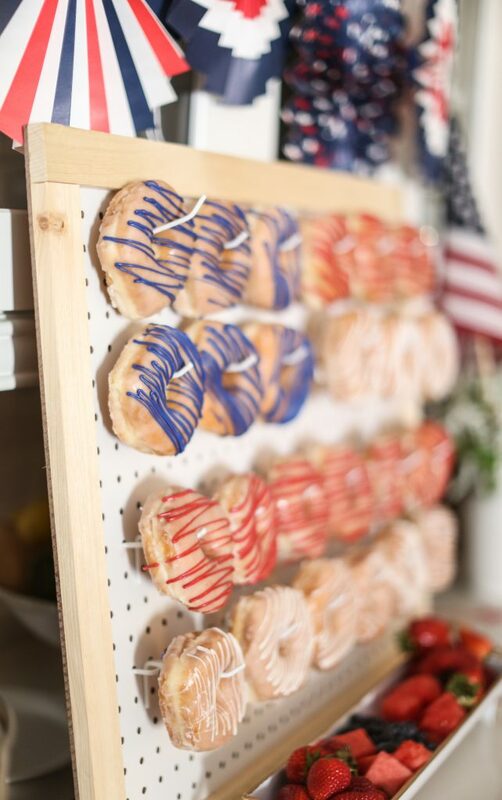 Summer is coming up and what better way to celebrate with red, white and blue on Memorial Day and Fourth of July! 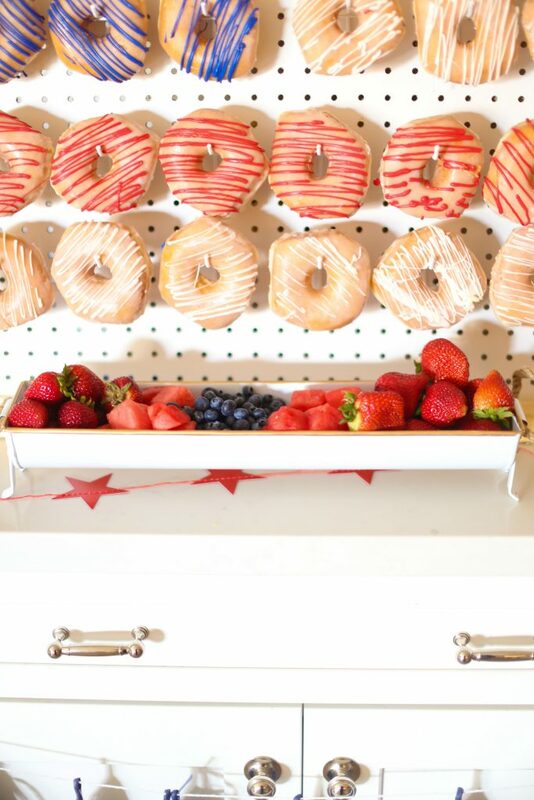 Take a pre-made peg board and use hooks to hang donuts on them! You can wrap them in individuals or hang them up for a centerpiece display! 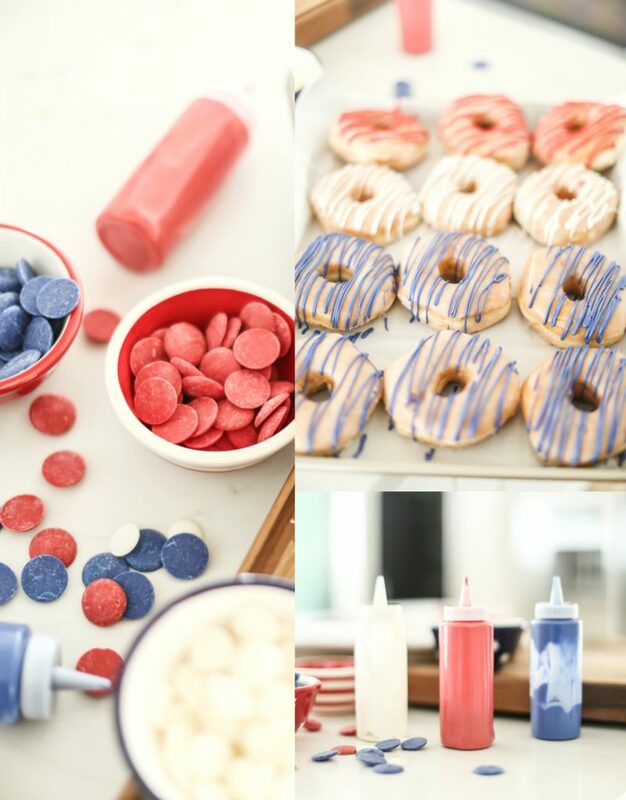 You can ask your local bakery to make some red, white and blue donuts or you can use the melting chocolate from Michaels to make your own! Melt the chocolates in these small bottles and then drizzle them onto the donuts! It’s really simple and doesn’t take a ton of effort or prep. The chocolate hardens within 15 minutes. 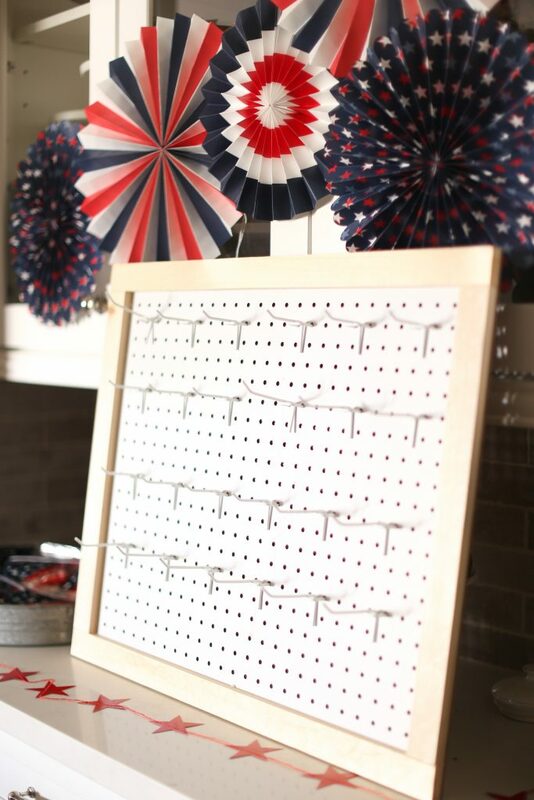 I used a pre-made pegboard from Michaels along with some hooks. You can find both at your local store or online! 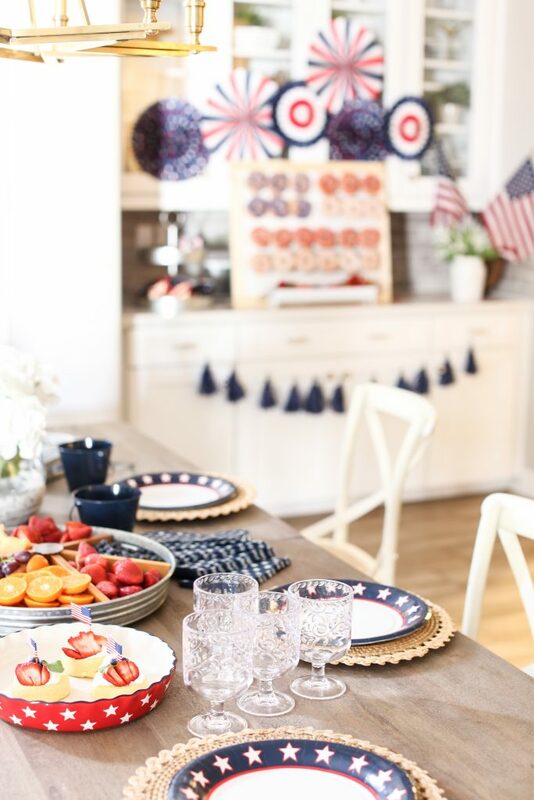 You can add any type of festive decor in red white and blue. 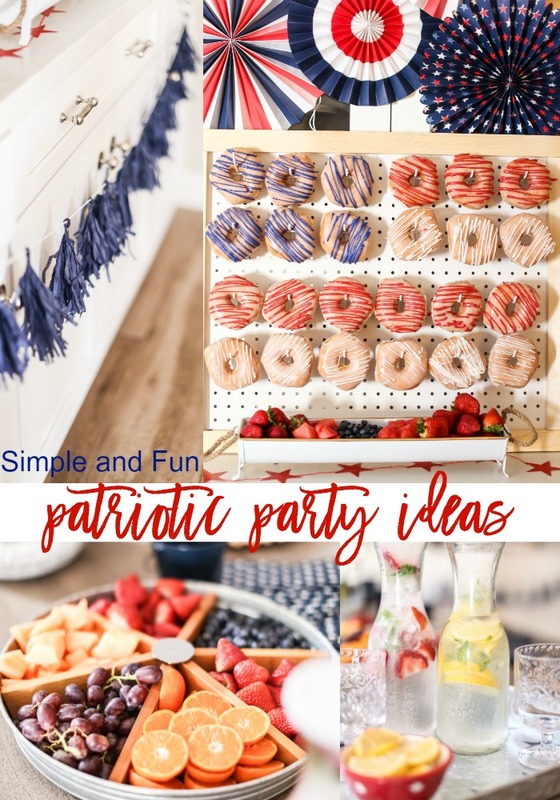 I like anything that is easy so I purchased this kit for a collection of patriotic party decor! 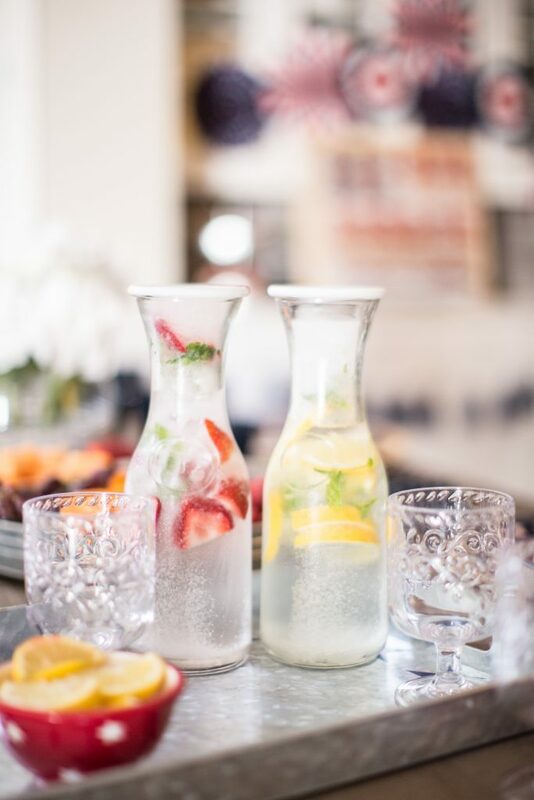 Take these glass carafes with lids from Michaels and make your own sparkling water for guests to enjoy! 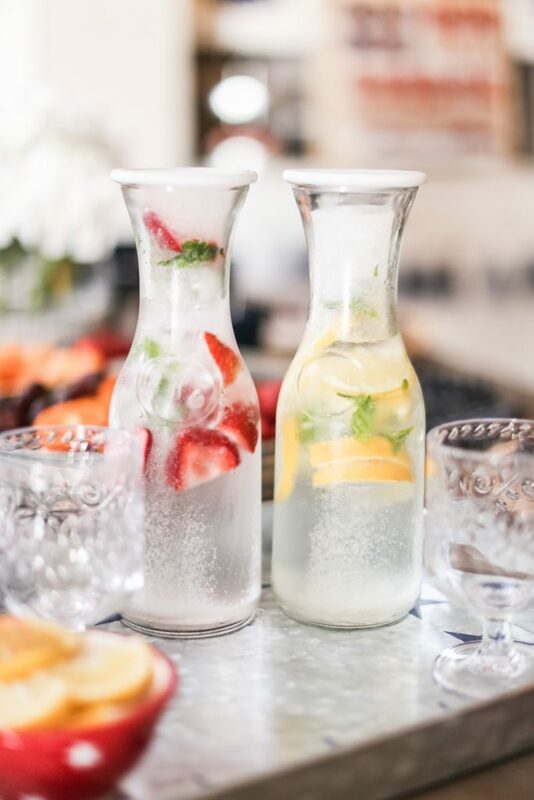 Use fresh strawberries, lemons or even blueberries and insert them into the bottle along with some fresh mint leaves. Fill it up halfway with sparkling water and then a hand full of ice cubes. This keeps all the fruit down. Then add the rest of the sparkling water and serve! Right now Michaels is full of summer decor and summer supplies. I picked up the adorable acrylic glasses just for outside use. They are so fun! No need to go overboard! Use flowers to line the center of the table and blue buckets for individual servings of wines and beers. Leave a charger on each seat so guests can make themselves at home! Make the table a place to graze over food. 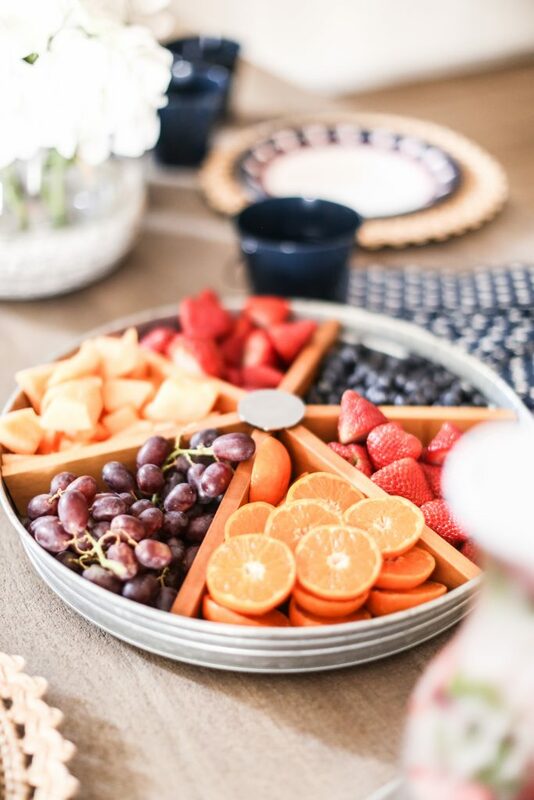 Use fresh fruit and veggies along with some snacks for the kids. Guests can serve themselves as the go or sit down to enjoy a plate full or ribs, hamburgers and macaroni and cheese! 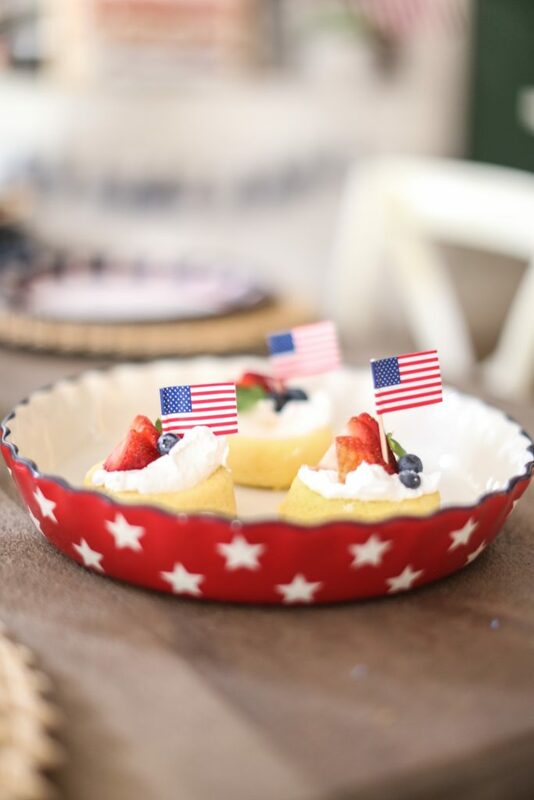 Patriotic touches are simple when you use little American flags like these! Get this cute pie pan in stores! 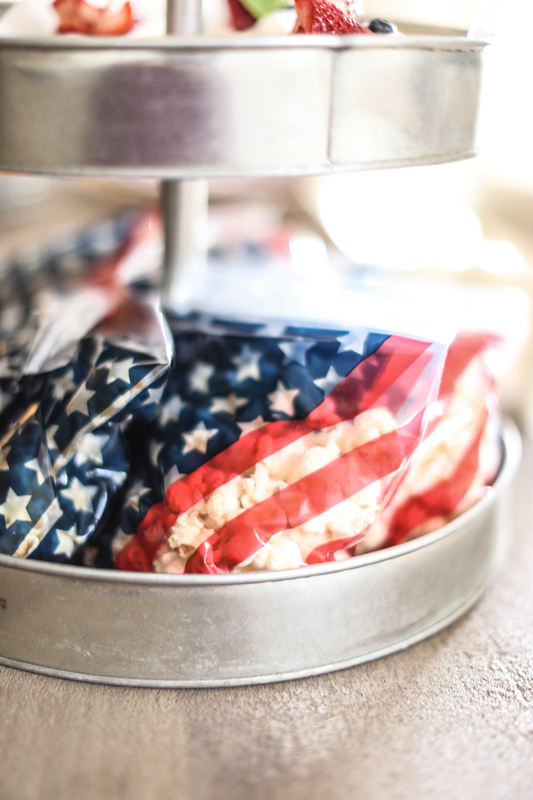 Fill bags with popcorn and pretzels for all the littles! 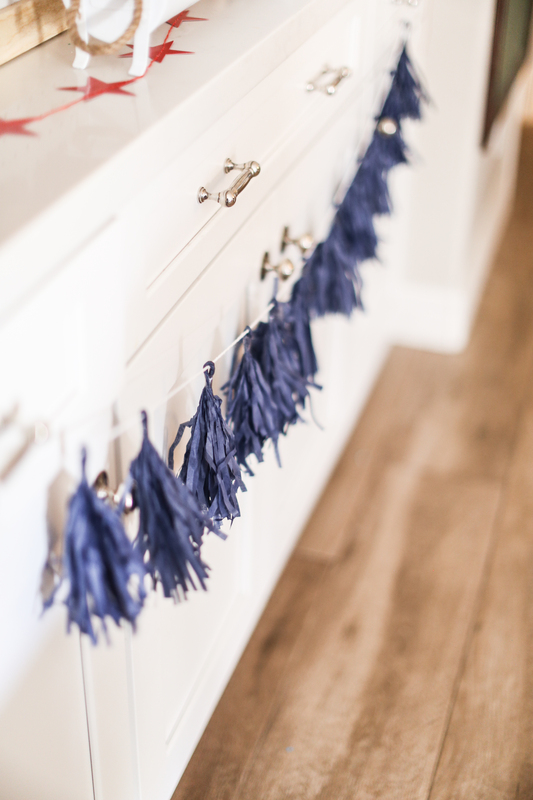 Order tassels like these in bulk on line and make a patriotic hanging decoration for everyone to enjoy! 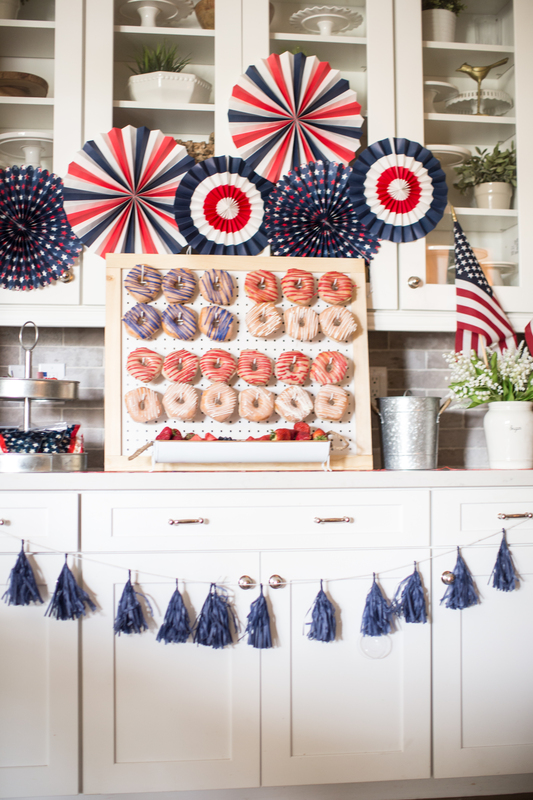 Bulk ordering is the newest thing on Michaels.com and I LOVE it for parties! You can order plates, forks, knives, cups and even food warmers like these for all your goodies you will be serving to that BIG crowd! Bulk buys have arrived at Michaels! Now you can order in bulk online and save up to 50%. Perfect parties, classrooms, camps- you name it! 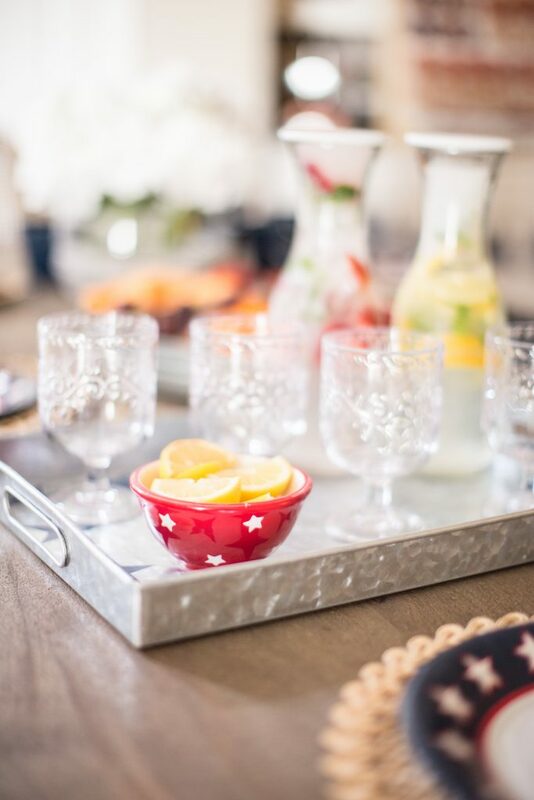 Plan your next Summer party or BBQ with ease and stock up on all the elements you need now. What will you be celebrating this summer? 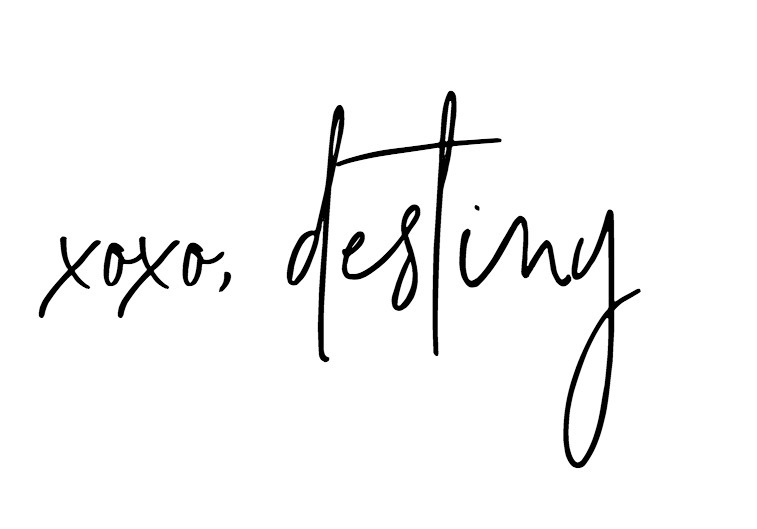 These ideas are adorable! 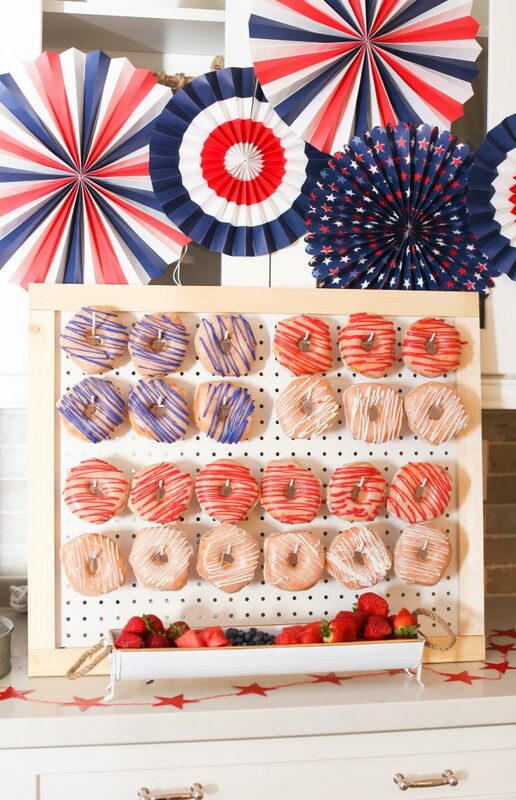 My kids would go crazy for the donut peg board!